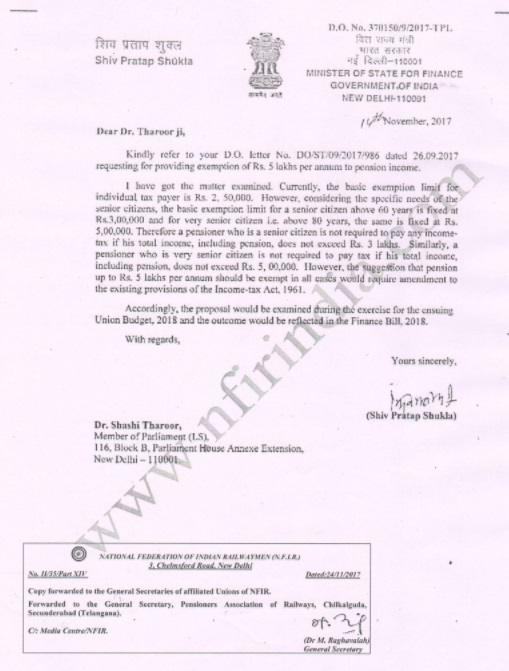 Home MoF ORDERS PENSION Clarification to pensioners about the hike in exemption limit to Rs 3 Lakhs from Minister of State for Finance. I have got the matter examined. Currently, the basic exemption limit for individual taxpayer is Rs, 2, 50,000, However, considering the specific needs of the senior citizens, the basic exemption limit for a senior citizen above 60 year, is fixed at Rs.3,00,000 and for very senior citizen i.e. above 80 years, the same is fixed Rs. 5,00,000. Therefore, a pensioner who is a senior citizen is not required to pay any income-tax if his. total income, including pension., does not exceed Rs. 3 lakhs Similarly, a pensioner who is very senior citizen is not required to pay tax if his total income, including pension, does not exceed Rs. 5, 00.000. However, the suggestions that pension up to Rs. 5 lakhs per annum should be exempt in all cages would require amendment to the existing provisions of the Income-tax Act, 1964.